We have enjoyed a creative relationship with Shop 12 Design in Las Vegas and Steelman Partners. The result has been some highly original work such as the vast Custom LED chandelier that was created for The Star Casino in Sydney. From the excellent design, illumination Physics solved all of the complexities and fabricated this remarkable lighting feature in just two months. The IP Diamond Light was specified as part of the Star World Casino Macau upgrade to its VIP gaming area. Some time ago, Shop 12 discussed another idea for a downlight that would be formed as a crystal that would be mounted on the ceiling in such a way that it would be in full view. The concept also included deliberate use of the complex facets to produce a pattern on the ceiling surrounding the luminaire. Using the working name IP Diamond Light, we developed the idea sufficiently for a technical specification and a prototype, awaiting a suitable application. The design of the IP Diamond Light was 90% complete but some experiments with lenses produced by CNC machining showed some refinements that could not be adequately simulated by the software. The improvements were added, and the moulds and dies were made in quick order. Within 40 days, the new product was ready for assembly, shipping and installation. 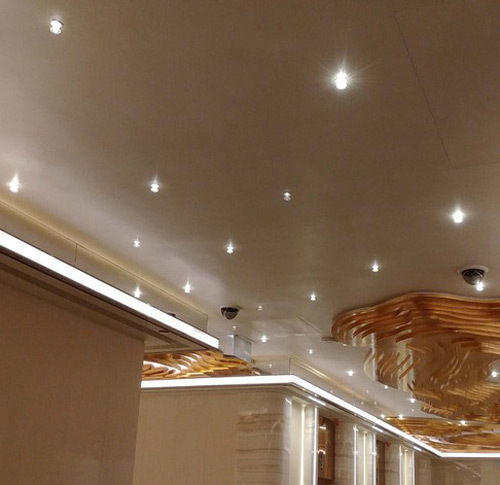 illumination Physics’ offices in Hong Kong and Macau provided technical support for the installation contractor. illumination Physics now presents the IP Diamond Light, adding a new sparkle in the form of a very compact downlight aimed primarily at the casino, hospitality and hotel industries. 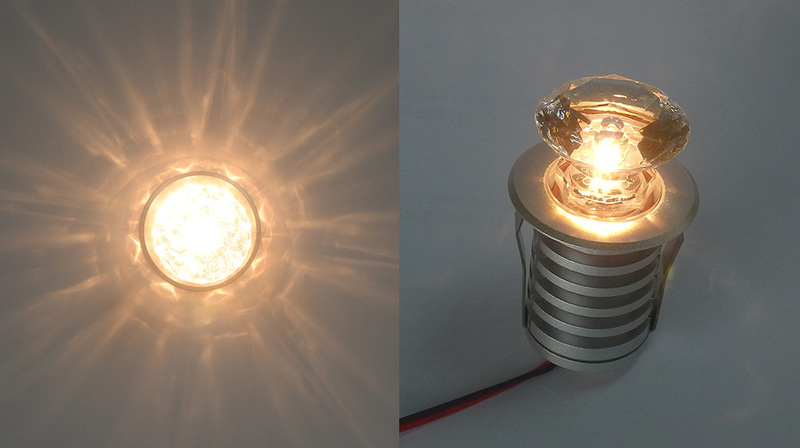 The IP Diamond Light uses a unique prismatic lens which resembles a faceted ‘round cut’ diamond in physical shape. The IP Diamond Light is fabricated from PMMA (Poly Methyl Methacrylate), a transparent polycarbonate that is superior in clarity to glass without any hue whatsoever. Overt decoration - its appearance sends a message. Projection - the diamond lens is designed to project facets of its crystalline form onto the ceiling into which it is installed, increasing its presence. This product provides a new choice in ceiling mounted luminaires making an overt statement rather than a concealed light source. The diamond lens is less than 50mm in diameter so, despite the obvious style and intent, the effect has sophistication. The IP Diamond Light is powered by a single three-watt Cree LED available in very warm white (2200K), warm whites (2700 to 3500K), neutral white (4000K) and cool white (5000K and above). Coloured LEDs may also be specified. The IP Diamond Light is powered by a selection of illumination Physics’ DMX or DALI controllable drivers providing dynamic or static dimmable displays. A subtle sparkle is highly effective.